Gimbaled captain's clock of solid polished brass is housed in a felt-lined octagonal chest. 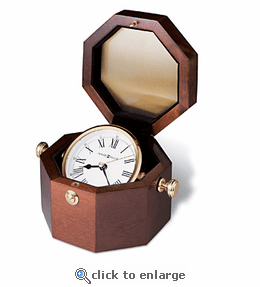 Lid with push-button catch opens to a white dial with black Roman numerals and hands and a brass second hand. An octagonal plate suitable for engraving is included (unattached). Finished in Windsor Cherry on select hardwoods and veneers. Felt bottom protects your desktop. Quartz movement includes the battery. As a special offer, we will add up to three lines of engraving at no additional charge. Engraveable items require extended production time. Approximately 3.5"x6.5"x5". Expertly crafted by Howard Miller.